Hello there, it’s time for another Watercooler Wednesday Challenge and Heidi is our lovely hostess this week with an All About Occasions Challenge. My card this week uses some more of the gorgeous DSP from Stampin Up called ‘Botanical Butterfly’ I’ve used this a few times on other cards and had a few left over pieces which I decided not to waste and use them as panels on this card. I spot coloured little bits of butterflies with my Stampn Blends and added a sentiment from the SU ‘Butterfly Gala’ stamp set. I then mounted each panel on black card stock to further highlight the DSP, then mounted the trio on a white card base. Come join in the fun and make a card for any occassion. Check out the projects that the other artists at Watercooler Wednesday Challenges have created, then take the challenge and link your creation to the challenge post. We’d love to have you join us. You have until Tuesday, 5h March at 10:00 Melbourne Time or Monday 5pm US Mountain Time to link up your project. So I’m back in my craft room this morning as this afternoon I’m going back to my mum’s house to clear out the remainder of her clothes and I knew I would need to get my mind set for the task. First up is a card for the challenges over at The Library Challenge, CAS Mix Up and The Flower Challenge. I was inspired by the word ‘note’ on the book and decided to make the front of my card look like a couple of ‘note’ pages torn from a notebook using a notepad die. I stamped the flowers and leaves from the Stampin Up set called ‘First Frost’ in Lovely Lipstick and Granny Apple Green inks. 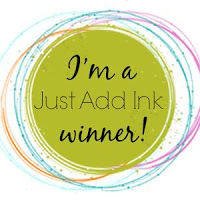 The sentiment is from Stampin Up ‘Part of my story’ – this is my newest set to get inky! Next up is a card for CAS Colours & Sketches and Freshly Made Sketches. I love how soft this colour combo is and thought it would look lovely on the Wonderful Romance stamp set from Stampin Up. I kept my card super CAS and placed the main floral image along the base of the card matching the FMS sketch. Next up is a card that just makes me smile. It’s for the current challenges at CASology and Just Add Ink. I recently bought a crafting magazine that had a stamp set attached (called new Year New You)and I just knew the bunny had to be coloured and the sentiment was perfect to be gold heat embossed. I did some ink smooshing for the background and water coloured the bunny. I added a little bit of gold thread behind the gold edged circle, distressed the edges of the ink smooshed background and the card was done. Well, that’s it for today. Thanks for looking and enjoy the rest of your weekend. Hello there, it’s time for another Watercooler Wednesday Challenge and Marsha is our lovely hostess this week with a Masculine Anything Goes Challenge. My card is using another alcohol inked background I had in my stash which I added the sentiment from Mama Elephant’s ‘Make a Wish’ stamp set and mounted it on some green card stock and then onto a black card base – simple right! Come join in the fun and make a masculine card. Check out the projects that the other artists at Watercooler Wednesday Challenges have created then, take the challenge and link your creation to the challenge post. We’d love to have you join us. You have until Tuesday, 26th February at 10:00 Melbourne Time or Monday 5pm US Mountain Time to link up your project. For my card I started with a piece of watercolour paper and masked off a heart shape. I then sponged Stampin Up Powder Pink and Poppy Parade inks into the heart shape. I squirted the sponged area before removing the mask to blend the inks together and then stamped the sentiment from MFT called ‘all about you’, in Momento black ink. I added a few sequins to match the sketch and I was done! I really like how this turned out and will put it aside for next year. Hello there, it’s time for another Watercooler Wednesday Challenge and Charlotte is our lovely hostess this week with an All About Occassions Challenge. My card this week is uses some gorgeous new DSP from Stampin Up called ‘Botanical Butterfly’ which I spot coloured the main butterfly with my Stampn Blends and added a sentiment from Fresh Squeezed Stamps called ‘Words to Live By’ (discontinued) to the side. This card is for an ex-colleague of mine who is getting married very soon. Come join in the fun and make a card for any occassion. Check out the projects that the other artists at Watercooler Wednesday Challenges have created, then take the challenge and link your creation to the challenge post. We’d love to have you join us. You have until Tuesday, 19th February at 10:00 Melbourne Time or Monday 5pm US Mountain Time to link up your project. Today Miss K had a new friend from high school over so I was able to get a bit crafty. I managed to make 3 cards that fit 5 challenges. First up is a card for the current Freshly Made Sketches challenge. I made a card for Miss K for Valentines Day using the bokeh technique following the FMS sketch. The sentiment (which is perfect for her) is from Altenew called ‘Everything About You’. I really like how this turned out and I hope she likes it too. Next up is a card for the current Seize the Birthday challenge which has an optional topping of black and white. I used the dies from the Stampin Up ‘Butterfly gala’ set and the sentiment is from ‘Amazing Life’ Behind the white die cut butterfly is some acetate so you can see through this card. For the trio of images from the CTS sketch I used one of the halftone circles from Altenew inked up with Stampin Up Night of Navy ink. I die cut a butterfly from yellow card stock and added a sentiment from Waffle Flower ‘In Every Way’. Well hello everyone and thanks for joining us for the Paw Prints on my Heart Blog Hop. This is a blog hop that’s all about our fur babies! You should have arrived from Pink Zebra Paper Creations, if not you can start from the beginning with Connie. This is a one day blog hop, but you have until 10pm Sunday 10th February (US Pacific Coast time) or 5pm Monday 11th Febraury (Melbourne time) to finish hopping and leaving your love for all of these talented crafters. We have two awesome sponsors for this hop – Alicia Bryant from Golden Goddess Designs who is supplying the gorgeous Woodland Animals die set and Rey Mysterio with Orquide Art who is giving away this beautiful Mixed Media Tag she created. So, what do you need to do to win? Easy… become a follower of each of the fabulous blogs in this hop and leave each of them a comment, letting them know what you like best about their projects. If you’re one of the lucky winners there will be free shipping to the USA, but if you’re worldwide you will be asked to pay shipping. You’ll need to hop and leave a comment on every blog to be eligible to win. Winners will be announced on Wednesday 13th February (US Pacific Coast time) or Thursday 14th Febraury (Melbourne time) at Connie Can Crop. For my card, I used a new stamp set from Stampers Anonymous called ‘Mister Meow Meow and Tweets ‘ for my card. Don’t you love the stamp name? I stamped the main cat image in black and heat embossed him. I then messy water coloured him in and added some bubbles to the top for a bit of interest and balance. I mounted the panel on black then white card stock. You’ll see the cat is fussy cut out – that’s because when I was adding adhesive on the back, I laid it down on some ink I had failed to clean up and I got messy marks on the panel; I didn’t want to waste my image so just cut out the ruined bits. This guy remindes my of my Oscar, a rather regal ginger cat.